The sun is out, the birds are signing and children all acrossthe state are loving their time away from the classroom. Although September seems like a lifetime away, it will be here before the blink of an eye, which mean it’s time to start thinking about school supplies. Presumably, no parent looks forward to back to school shopping; it’s time-consuming, groan-inducing and expensive. In 2015, the estimated cost to send a child back to school was approximately $630. Shopping is a necessary part of the annual routine for parents. Fortunately, however, the process will be a bit easier this summer – thanks to the Wisconsin Sales Tax Holiday. For a full list of tax-exempt items, please follow this link. If our school supply estimate is correct, parents could see nearly $35 in savings, which means that now is the perfect time to stock up. After all, back-to-school shopping + no sales tax = happy shoppers. This week, as you are planning your back-to-school shopping, consider making an impact with your extra savings. Think about buying a few extra boxes of tissues for the hard-working teachers or purchasing additional school supplies for a family in need. Together, we can help prepare our children for another successful school year with all of the necessary tools they need to learn. Remember, that even a little help can make a world of difference. Happy Shopping from Lions Pride! There is not a photo available that sums up the Wisconsin Lions Camp better than the image on the right. 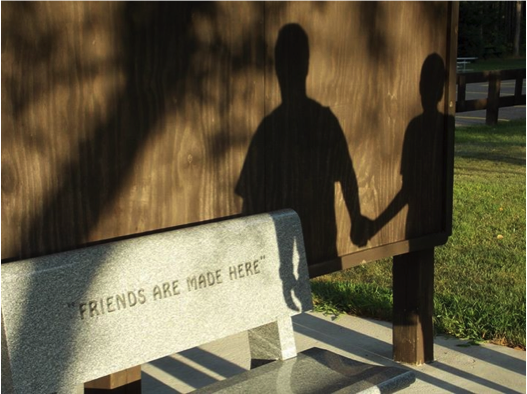 It is a place where lifelong friendships are made. As you may know, Lions Camp provide a week of camp for children with special needs that includes experiences and skills that will serve them today, tomorrow and years to come. All this is provided at no cost to the families. At Lions Pride, one of the best parts of our job is the opportunity to work with our donors to help preserve, protect and provide so the WLF can continue to provide these experiences for today and for future generations of campers. Do you know a child that would benefit from Lions Camp? Don’t wait! Here is a letter from the Camp Director that will answer most of your questions. It is time to get an application in because the youth camper deadline is quickly approaching. All applications must be postmarked by May 27, 2015. As many as 70,000 children with disabilities have attended the Wisconsin Lions Camp since its inception in 1964; we’d love to see that number keep increasing. Help make summer of 2015 one to remember for a child with special needs. Share this blog post with family, friends, teachers and business associates. Thank you for helping us find more eligible campers!